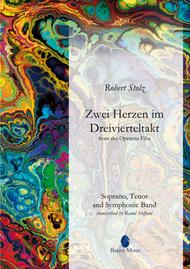 From the Operetta Film Zei Herzen im Dreivierteltakt. Composed by Robert Stolz (1880-1975). Arranged by Raoul Steffani. Baton Music Vocal Seriesl. Score only. Duration 3:30. Published by Baton Music (BF.BM678-SCORE). In a life spanning almost ninety-five years, Stolz wrote in excess of 2000 songs, dances and marches, as well as the music for more than 50 stage works, 60 films and 19 ice revues. In 1929 the German motion-picture production company Universum Film AG asked him to compose the music for the film 'Zwei Herzen im Dreivierteltakt'. The title waltz is nowadays one of the most famous Stolz melodies worldwide.